I'm sure one day I'll do a more thorough article on the remnants of the Southern Pacific Railroad throughout San Francisco, but for today I'll focus on just the area immediately around what is today the San Francisco Caltrain station at 4th and King. Today's San Francisco terminal looks like a definite end of the line for Caltrain, but in the early 20th century, when these tracks were still the property of the Southern Pacific Railroad Company, trains were able to pass through this point in a variety of different directions. 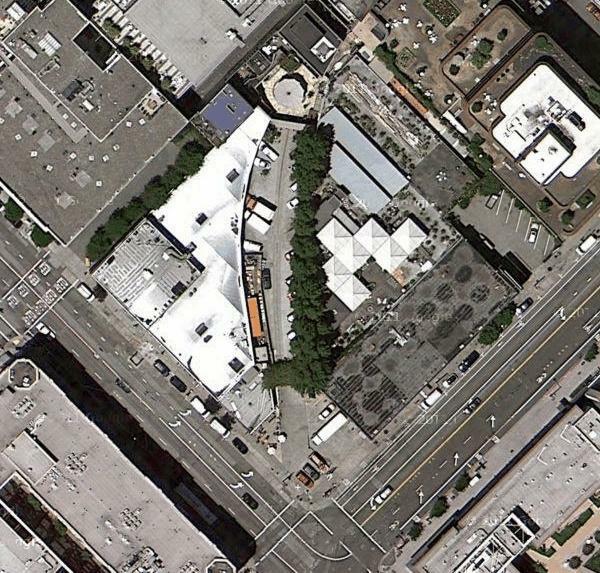 This curved roadway through the block kitty-corner to the Caltrain Station is one of the few clues that the railroad used to continue beyond the current terminal at 4th Street. Across Townsend St from the Caltrain station, between what is today the Creamery coffee shop and the HD Buttercup furniture store, there is a curved cutting between the two buildings that from street level just looks like a delivery entrance, but from above betrays the path of a set of rails that proceeded across the intersection of 4th and Townsend to what is now an alley at the end of Lusk St and on to make a left turn onto Ritch St and straight ahead to cross Third Street halfway between Townsend and Brannan Streets. Meanwhile to the south another set of rails proceeded along King St to connect with the State Belt Railroad, though sadly the reconstruction of King St into a wide boulevard for freeway access has left little evidence of this visible today. 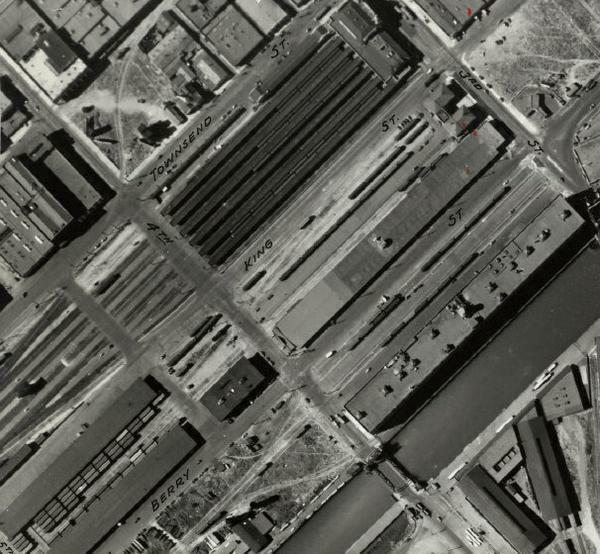 Southern Pacific Railroad depot at 3rd and Townsend in 1938, also showing the tracks feeding out on to King St and across Townsend towards Ritch St. An extra street, known variously as "4th St West", "4½th St" and "New 4th St", was paved just to the west of 4th St to allow traffic to pass when longer trains blocked the "real" 4th St. But the most significant extension beyond 4th Street, at least from the perspective of rail passengers, was the extra block of trackage leading to the old depot and terminal whose entrance was on 3rd Street between Townsend and King Streets. This building, far more elegant in appearance than today's Caltrain station, was the passenger entrance to the railway until it was closed in the 1970s. The location at 3rd Street presented the problem that longer trains at the station would extend across 4th Street into the next city block, preventing the passage of road vehicles. The new terminal was constructed one block further back, facing on to 4th Street. 5th Street was already blocked by railway infrastructure, so long trains were no longer an issue. 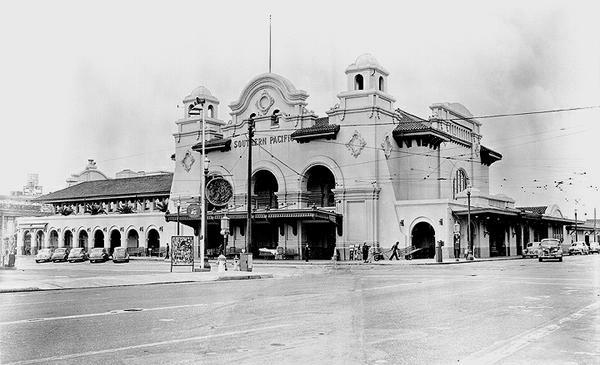 The Southern Pacific depot entrance at 3rd and Townsend Streets, circa 1950. Southern Pacific passenger service was taken over by Caltrans in 1980, after the private company was no longer able to turn a profit on passenger service. This new service was branded Caltrain, and it continues to serve peninsula commuters today. Southern Pacific Railroad was incorporated into the Union Pacific Railroad in 1996. There are plans to extend Caltrain service beyond its current terminal to the new Transbay Transit Center in coming years, though this would be via an underground tunnel rather via any historical Southern Pacific right of way on the surface.